Apple published on its website the iPad's environmental report, and for us this is a great opportunity to find out more answers in our quest to determine if the iPad, Kindle and other e-Book readers are a greener way to read books comparing with physical books. 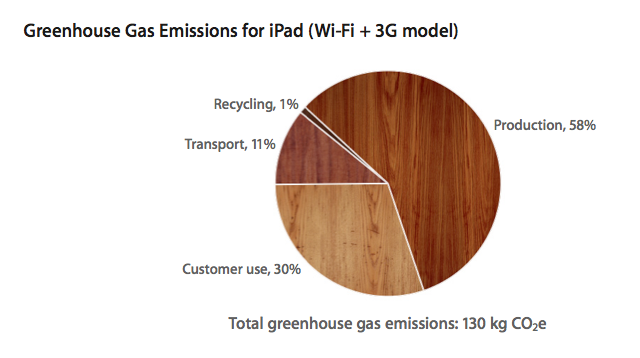 Today we bring you the first part our analysis of this report, which will be is focused on the iPad's carbon footprint. Tomorrow we'll bring you the second part which will focused on the other environmental and social impacts of the iPad that are described on the report, as well as the ones that are still missing. Before we start, we have to say a good word here. By publishing this report on their website, Apple is doing something that none of the other companies that sell eBook readers like Amazon and Barnes & Noble bothered to do so far. So Kudos to Apple for this move and we can only hope others will follow suit. We believe it's this information is viable and all consumers should have it available. As you can see, production is the biggest contributor (58%) followed by consumers use (30%), transport (11%) and recycling (1%). Now, when we have Apple's official carbon footprint figure, let's try to compare it to physical books. For this comparison, I'll use the figure of 7.46 kg of CO2 to represent the lifecycle carbon emissions of an average book. This figure was presented on the Cleantech report (The Environmental Impact of Amazon's Kindle) and according to the report based on three independent studies that used life cycle analysis calculators to assess the impact of raw materials (I know it's much higher from the figure of 4.01 kg presented on the 2007 'Environmental Trends and Climate Impacts: Findings from the U.S. Book Industry' report, but I believe it helps to make the comparison more balanced). So, comparing between the two gives us the following equation: 1 iPad = 17.4 physical books. It means that if you put aside all the other uses of the iPad, then from a carbon footprint point of view, it becomes a more environmental friendly alternative option for book reading once you finished reading your 18th book on your iPad. This result is quite surprising. If you look for example at the life cycle analysis of Daniel Goleman and Gregory Norris, which was presented on the New York Times Op-Ed piece, How Green Is My iPad?, then you'll see that their conclusion regarding the break even point was that "When it comes to global warming, though, it’s 100 books." So, does it make the iPad a greener way to read books? Well, let's see. Firstly, how much time it will take the average person to read 18 books? According to the Cleantech report 1 billion books are sold every year in the U.S. With a population of about 300 million people it means every person in the U.S. is reading about 3.3 books a year. Another source is the Environmental Trends and Climate Impacts report, which mentions that 3.1 billion books were sold in 2006, which is an average of about 10 books per a person. So let's assume the number of books is 3-10 per a year. Taking these figures in account, it seems that it can take anywhere between 1.8-6 years for an average reader to reach the carbon break even point of 18 books. 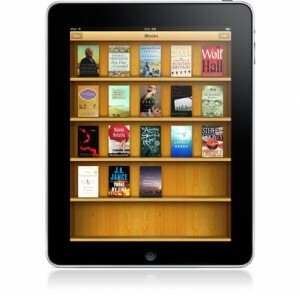 So if you're an avid reader, there's a good chance iPad is a greener option for you. For the average and below reader it depends of course on how much time you'll actually have the iPad. I doubt if anyone who bought it this year for example will still use the current version on 2016. They'll probably move to a newer version or another device during this time frame. But wait a minute, carbon emissions are not all. What about the the environmental impact of the materials used, waste and even the working standards in the manufacturing facilities (which came up lately with regards to the suicide cases in the Chinese company Foxconn that is one of Apple's main suppliers)? our second part of the analysis of the iPad environmental report. More resources on the e-Books vs. physical books environmental debate can be found on our website at www.ecolibris.net/ebooks.asp. 2. They are much cheaper. 3. I love to brouse in libraries and often find books I would not otherwise have read. 4. Even in locations without electricity, books offer an extended, lifelong education and entertainment. 5. Books can be taken easily onto boats, planes etc. without worry.